The Airbus 330 is a competitor to the Boeing 777 on medium to long range international flights. It was introduced into airline service in 1994, and variants contnue to be built. It is offered in 2 fuselage lengths; the original -300, and the shorter -200. In recent years several air forces have purchased freighter/tanker versions of the -200. Revell's A330 is almost identical to their A340 kit, which is unsurprising since the real aircraft are equally almost identical. It was issued only twice before now, first in Airbus house colours, and then LTU. The LTU kit offered a choice of engines that were not in the first issue. This issue contains only the Pratt & Whitney engines and a new decal sheet for a Thai Airways example. Since the kit plastic is mostly unchanged, the text of this review will be substantially identical to my earlier A330 review (link below). The parts are crisp and clean with little to moderate flash and no sink marks. What flash there is may be easily cleaned up except for some of the tiny parts where the challenge is to hold the part while you're cleaning it without it going *spung* off into the lair of the carpet monster. The finely scribed lines are out of scale for 1/144 but will still look good under a coat of paint. They match up very nicely. The fuselage is two halves from nose to tail. The cabin windows are open, with no clear parts provided for them. Either fill them or Krystal clear/Clearfix them; decal film just won't do it. No interior detail is provided, and the small windows would render any interior redundant anyway. The cockpit windows are the old-fashioned Airfix style strip, which makes getting them to fit properly without either breaking or falling into the fuselage something of a challenge. The panel lines are nicely engraved and match up well. The APU exhaust is left open, which means that one may look right through the fuselage. It should be filled with a small blocked off piece of tube to prevent the see-through effect. If the windows are left open, the interior should be painted black to prevent the model from looking toy-like. Revell advises that 15g of nose weight will be required. Rarely for 1/144, there is a cockpit interior provided, although it is moulded in one piece. Very little of it wil be visible through the cockpit windows but it does prevent the see-through look. The nose gear well has to be assembled before closing the fuselage. Revell would have you assemble the entire length of the strut, but this leaves it vulnerable to breakage during assembly. Since the strut is made in two halves, I recommend leaving the lower half off until final assembly. The main wheel wells are almost featureless, but since they will be covered by their doors, it doesn't matter. Revell chose to mould the lower portion of the wing-to-fuselage fairing as a seperate piece, which causes a few allignment problems. This piece is identical to the A-340 kit, and therefore a blanking plate is needed to close off the centreline wheel well which the A-330 does not have. 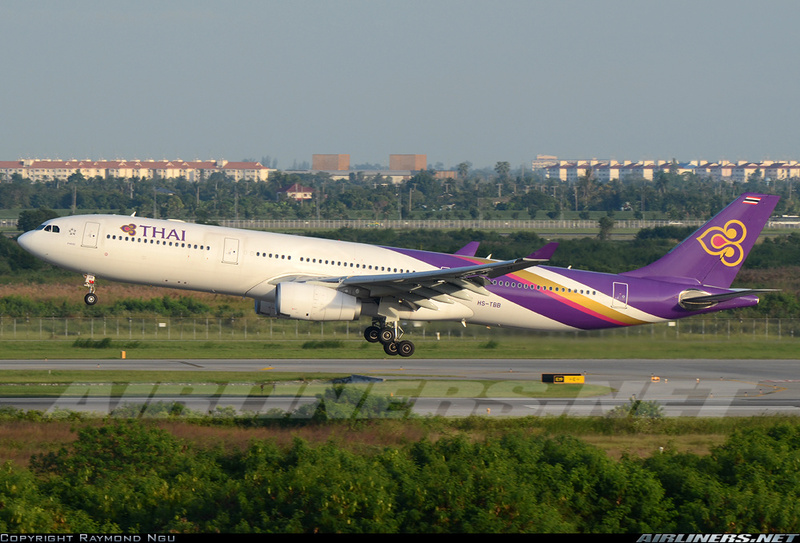 Thai Arways A330s are powered by Pratt & Witney PW 4000 engines. This issue has only the Pratt & Whitneys in the box, in contrast to the previous LTU issue. Rolls Royce Trents are available from Bra.Z resin should you desire the most popular A330 engine choice. The kit engines are very nicely done, being made up of two cowl/strut halves, intake fan, turbine fan and exhaust cone. I don't compare models to drawings or published measurements. When assembled it looks like an A330. The decal sheet is very complete, with a superlative variety of stencils. This kit offers any aircraft from Thai Airways, with names in English and Thai plus registrations sufficient to do all options. Window decals are provided and here is where the only registration error spoils an otherwise beautiful sheet. The dark grey window decals are in perfect register on the right half of the sheet but the farther to the left they go, the more out of register the grey is. It's worst on the far left of the sheet, where the landing lights are almost 1/4 out of register. Only the grey is affected, so if you choose to leave the windows open you'll lose only the landing lights. I can hope that this flaw only effects the sheet of the review kit since otherwise it's a work of art with crisp printing and bright vibrant colours. The purple will have to be matched on the vertical fin and rear fuselage. Revell provides a mix recipe for Revell paints only. If you use other paints you're on your own. If you don't like the kit decals there are many different choices provided by the aftermarket industry. Aftermarket windows are available from Draw Decals on their A340-600 sheet. HS-TBB “Phare” Coming home to Bangkok. Highs: Delicate parts with a lot of detail for 1/144 scale. Excellent and colourful decal option. Lows: Delicate parts mean that they can easily be broken or lost. Care must be taken while removing them from the sprues and handling them while building. The review kit's decal windows are out of register enough to be annoying. Are the wheel wells open in the center section. On the real thing you can look right through to the other side. Looks like a good kit. No, they're separate featureless boxes but it doesn't really matter since once the main doors are on you can't see in there anyway. It is a very nice kit, which is pretty painless to build.